Those of you who visit us regularly will know that Melrose is one of the most beautiful towns in Scotland. We thought we would write an article on the town to hopefully tempt you to return in the near future and also attract the interest of those who have yet to visit. 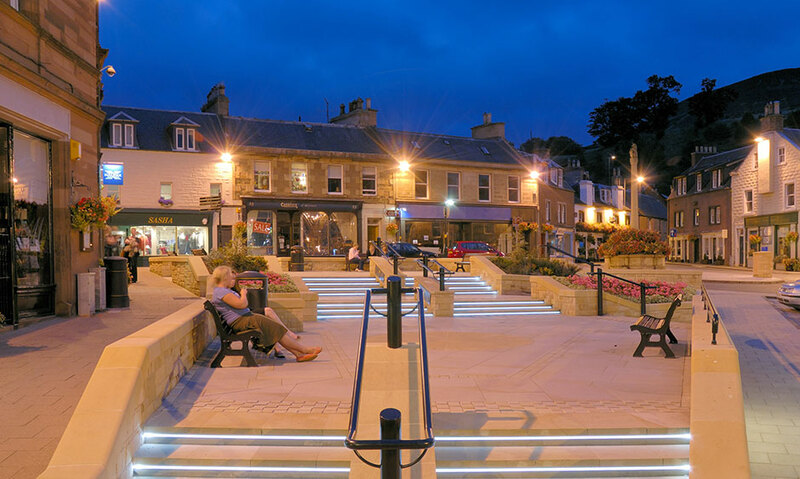 With recent events including the opening of the new Borders Railway and the Tour of Britain being covered extensively by the media, placing Melrose and the Scottish Borders in the spotlight, we are already enjoying welcoming many new visitors to the town. So for existing and new visitors alike, here are seven inspirational reasons to visit Melrose. Unlike many towns across the UK, Melrose is proud to have a wide range of fabulous independent shops. From local food suppliers including bakers, butchers, fishmonger and greengrocer, selling the best of Borders and Scottish produce, to a range of unique gift and craft shops to treat yourself, family or friends and bespoke boutiques selling clothes (including our world-renowned knitted cashmere) and shoes. After shopping till you drop, Burts or The Townhouse are the ideal places to relax and enjoy good food and award winning Borders hospitality. A visit to Melrose Abbey, which dates back to 1136 is a must, it provides such a dramatic backdrop to the town. While there, don’t miss the opportunity to visit the Chapter House, where the heart of Robert The Bruce is thought to be buried. Melrose has been inhabited for thousands of years, the Romans appreciating its beauty arrived here in AD79, building a fort named Trimontium meaning “the place of the three hills”. You can visit the Trimontium Museum (Mar-Oct) which is dedicated to Roman life in Scotland. For the avid gardeners amongst you, Melrose has two National Trust properties. Harmony House & Gardens (Mar-Oct), a grand house with beautiful flowerbeds and borders alive with colour in the Summer. Every June, this property comes alive when it hosts the popular Borders Book Festival. Priorwood Garden and Dry Flower Shop (Open all year) is a garden lovers heaven, with dried flower area, herb garden, heritage apple orchard and woodland garden. The shop stocks plenty of gift ideas including honey produced form the gardens own bee skeps. Melrose is the birthplace of Rugby Sevens with Melrose 7’s televised worldwide every April as the town welcome teams from across the globe to the Greenyards. It is definitely worth visiting the Melrose Sevens at least once to sample the unique sporting atmosphere, but the town also offers rugby on a regular basis with Melrose being one of the top teams in the Scottish premiership. The Greenyards also regularly plays host to Edinburgh in their pre-season matches and has welcomed Leicester and Romania in the past two years. Melrose is perfect for a relaxing break, but if you want to be a little more active, it has a range of world class activities right on it’s doorstep. Cyclists can enjoy the 4 Abbeys circular cycle route which links all four Border abbeys. For walkers, the town has plenty to offer. Great views can be had from the top of the nearby Eildon Hills and Scott’s View or a why not wander along the Tweed to Dryburgh. The town is part of Scotland’s Coast to Coast Route – The Southern Upland Way and also the starting point for St Cuthbert’s Way, a 100km route through the Scottish Borders to Lindisfarne. There is world class fishing on the River Tweed and not to be outdone, golfers can enjoy a round or two at the town’s extremely picturesque 9 hole course situated just below the Eildon Hills or sample many more courses including some challenging championship courses all within easy driving distance. Melrose sits at the foot of the triple peaks of the Eildon Hills, one of the most distinctive single landmarks in the Scottish Borders. Whether you choose to walk the Eildons, or simply look up and admire this iconic feature, they offer stunning views and superb photo opportunities. For walkers, the paths are very well marked and maintained and all three peaks can be walked easily in one day starting from the town. We cannot sing the praises of the enthusiastic and hardworking volunteers of Melrose in Bloom enough, they keep the town looking so beautiful all year long – from the countless hanging baskets and planters through the summer season to more sustainable planting for year round interest and colour. The town is a past winner of the Gold Award in the RHS Britain in Bloom. The team can often be seen in the warmer months with “Rosie the water tank” topping up the blooms and now as Autumn moves into Winter, the team continue to ensure that Melrose is looking its absolute best. The new Borders Railway (Edinburgh to Tweedbank), the longest railway line to be built in 100 years, was opened officially by the Queen on the 9th of September 2015. Melrose is a short walk (20-25 minutes) from the station at Tweedbank or, if you prefer, we can arrange for a taxi to pick you up and drop you off at our door. We are extremely excited about the opening of the railway which is being promoted by VisitScotland as one of the most scenic train journeys in Scotland. We hope we have given visitors, old and new, some inspiration to visit Melrose and the wider Scottish Borders area in the near future. Travelling by car or “letting the train take the strain”, check out our spectacular Autumn and Winter deals at both Burts and The Townhouse.